Google is making the Android Studio faster, and allowing for code changes to run instantly in an emulator or on a physical device. The aptly named ‘Instant Run’ feature is optional in Android Studio 2.0, but handy for seeing changes to code run almost instantly. Simply clicking the ‘run’ option after making your changes will quickly let you see how your new code performs. 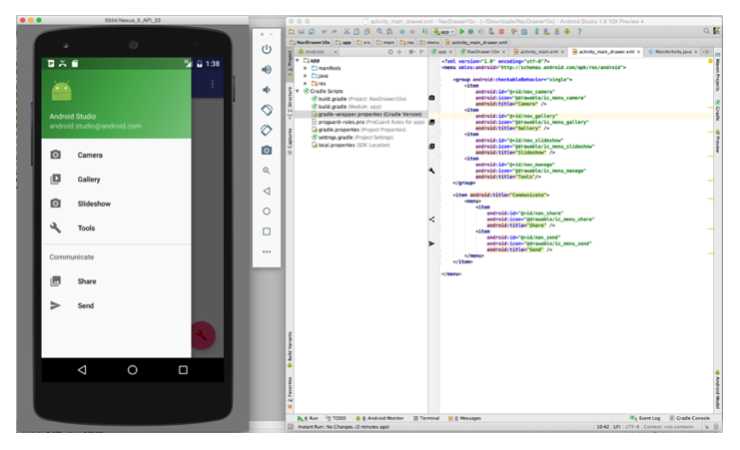 Android Studio’s emulator also has a refreshed interface, with a new floating toolbar. You can add APKs to the emulator via a drag-and-drop function, and resize it by dragging the corner of the window. Still in beta, a new ‘GPU Profiler’ tool lets you record entire OpenGL sessions, and see all the changes that occur frame by frame. You can see the code for each frame, and get info on the GL State and Commands. Google tells me the idea behind the new Android Studio was speed; it’s now five times faster when writing code for Android Marshmallow, and Instant Run populates builds up to 50 times faster than before. You can download the new Android Studio from the Android Developer Website.